This year, I made some cupcakes inspired by these, except I made them more Valentine’s Day friendly by adding CHOCOLATE! 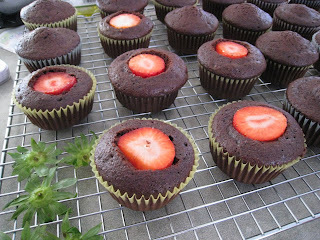 I stuffed devil’s food cupcakes with strawberries, and frosted them with vanilla buttercream. These are such pretty little things! I LOVE that you used the strawberry top, it’s such a pretty presentation – and delicious too, I bet!